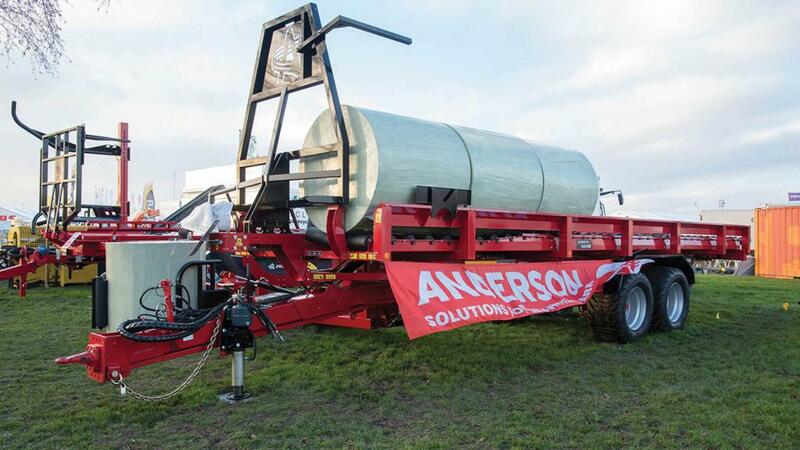 Anderson importer D Clifford and Sons took the wraps off its RBM2000 Pro – a round bale collector trailer for use with wrapped and unwrapped bales. 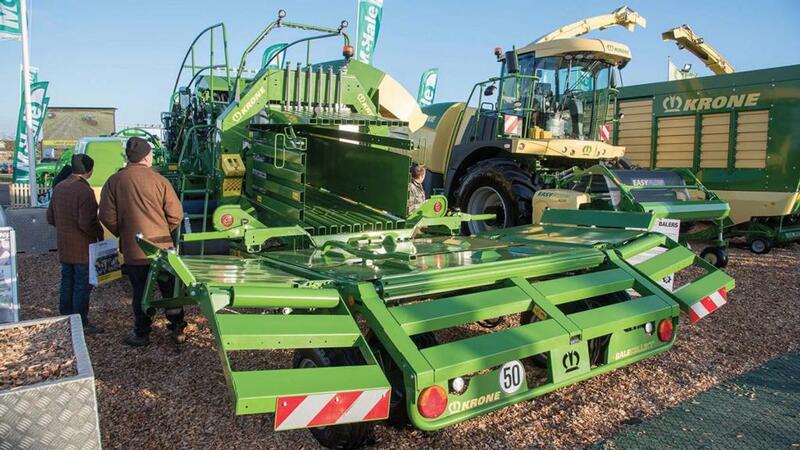 Capable of carrying 20 bales – two rows of seven bales on the bottom layer and six bales on top – the self-loading trailer uses an innovative collecting arm which retracts on contact with the bale. This process enables bales to be lifted on-the-move, but without damaging film, it says. The RBM2000 Pro costs £47,000. TRP Imports continues to develop its Prairial grassland rejuvenator. And the latest changes include the introduction of the RS version – Roll and Seed. 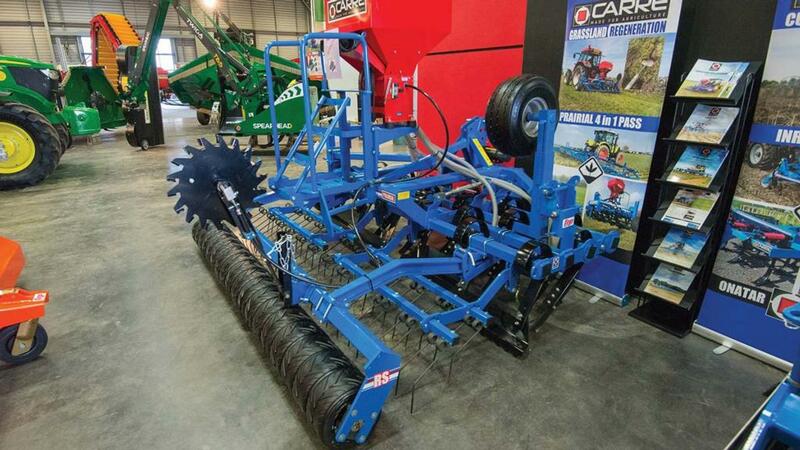 The tractor-mounted implement is capable of aerating, levelling, over-seeding, scarifying and now consolidation, thanks to the development of a FarmFlex rubber tyre press which can also be retro-fitted to older Prairial models. The firm’s Sean Stansfield says he opted for the 330mm diameter tyres in favour of cast iron press wheels to save on weight. 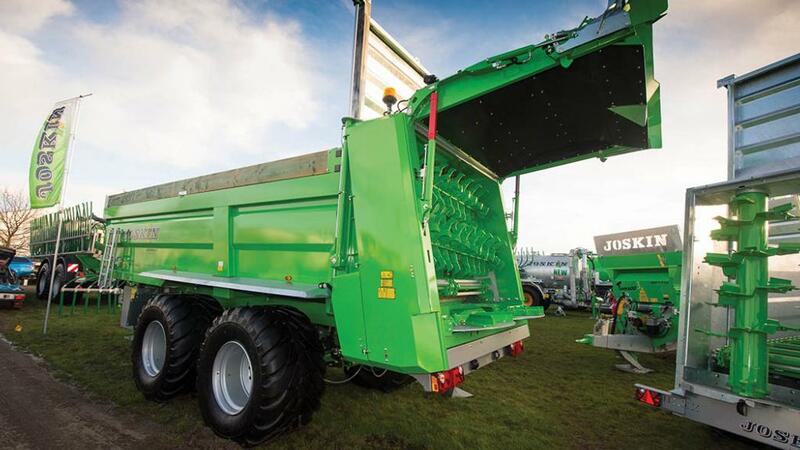 Available for 3m, 4.5m and 6m models, the rear packer option costs £3,500. 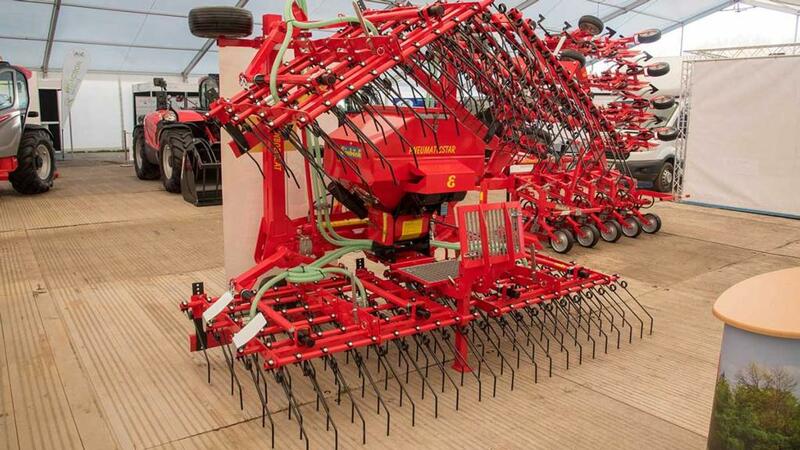 Terrington Machinery has introduced a new version of its grassland overseeder with heavier duty 10mm tines designed to give a more aggressive action for older pastures which are not suited to ploughing up and reseeding. Intended as a step up from the more basic models with a heavier frame, the SR model is available in 3 and 6m versions with 300 or 600 litre pneumatic seeder boxes. McHale has added a higher capacity twin rotor rake, aimed at farmers and contractors rowing up for self-propelled foragers. The R68-78 has a hydraulically adjustable working width of 6.8-7.8m, with 13 tine arms. Central greasing reduces maintenance, and cam track adjustment via a lever allows the shape of the swath to be fine tuned. The heavy duty drive is via a split gearbox. 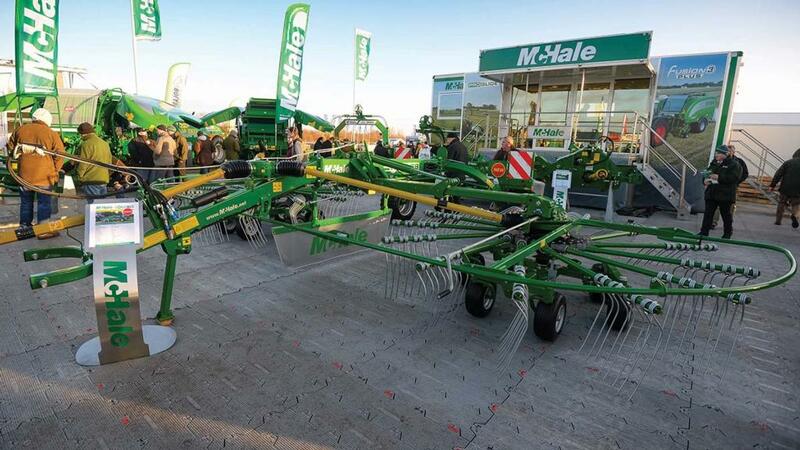 McHale plans to offer a limited number of rakes in 2018, with the UK and Ireland as the target markets. 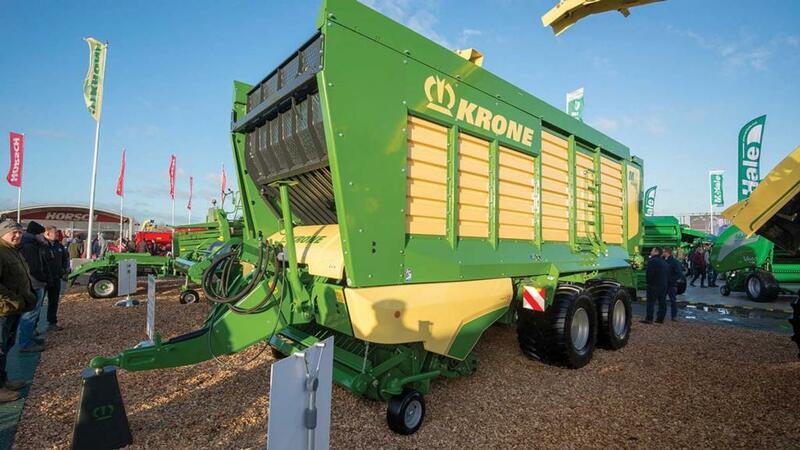 Krone was gauging customer reaction to its new Bale Collect system, designed to work with its Big Pack square balers which accumulates up to three, 120cm-wide bales together for easier collection. Bales can also be placed in pairs or with a gap between two for the wrapper, or a single bale can be offset to meet a CTF pattern. Hydraulic pusher arms move the bales along its bed and ultimately off the back. In operation, steering wheels help to follow the baler. For transport, the side wings fold in, and the collector is pushed back onto its drawbar to pivot behind the baler. The MX is the latest in Krone’s new generation of forage wagons, and its modular build offers six sizes from 33 to 40cu.m. Extra capacity is offered by an angled headboard which can also be used to speed discharge and make for easier filling when used as a trailer. The cam-less pick-up features a staggered tine arrangement which brings the crop into the centre, and 46 knives give a 37mm chop length. Krone plans to add its automatic knife sharpening system later in the year. A further option is a hydraulic compensating axle which pushes oil into the low side of the wagon on a bank, increasing stability. Massey Ferguson and Fendt showed a range of grass machinery from Agco’s acquisition of Lely, with most of the products available in the red or green livery. There are a few exceptions though, the Tigo forage wagon will be a Fendt product and will make its debut at Grassland UK, while the Storm trailed forager goes to Massey Ferguson. 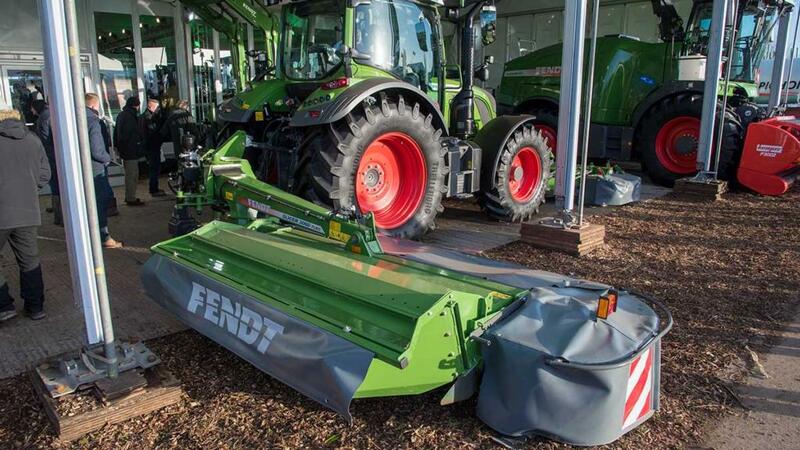 “We expect products such as the rakes, which are a good fit with our Katana forager, to be big sellers for Fendt dealers, for example,” comments Fendt’s advertising and sales promotion manager Richard Miller. Lely’s round balers will be available for both brands, which compliments an existing range of Hesston-sourced square balers. Agco dual brand dealers will be able to offer both red and green grass machinery. The former Lely baler and forage wagon plants in Germany are now run by Agco, and Lely staff transferred across at the start of the year. While product is still currently available in Lely colours, this is due to end sometime this year. 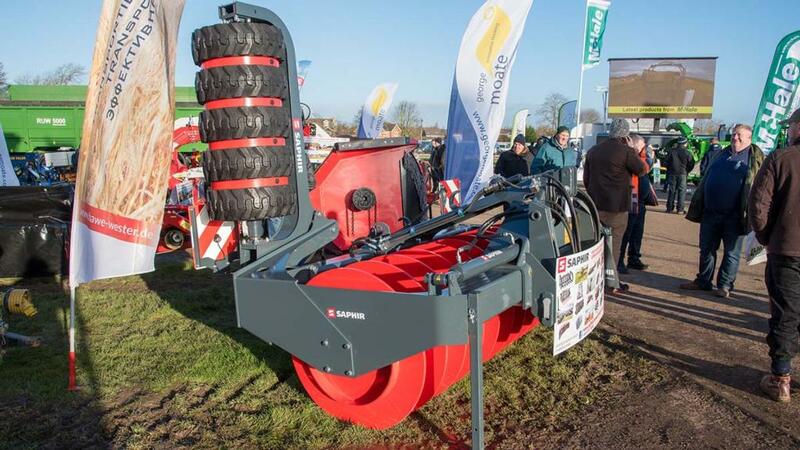 UK importer Suffolk Farm Machinery showcased German-built Saphir attachments at the event for the first time. Along with grabs, buckets and blades, the most noticeable implements were a heavy-duty clamp roller, and an alternative take on a tractor-mounted buck-rake. Unlike a conventional push off design, the Saphir features two large rams and cam rollers to pivot the fork forward by up to 90 degrees, allowing the crop to be feathered out as you progress up the clamp. Measuring almost 3m wide, the buck-rake requires one double acting spool, and weights 1,500kg. To improve clamp ensiling, the firm’s clamp roller was also shown (pictured). The 950mm diameter steel ring roller can be ballasted up to four tonnes, and has a three metre working width to faster cover the clamp. To keep the tractor away from the clamp’s edge, 700mm hydraulic side shift is available and a folding tyre packer can be used to work the sides of a clamp. Retail price for roller starts from £8,630, with hydraulic tyre packer adding a further £2,990. 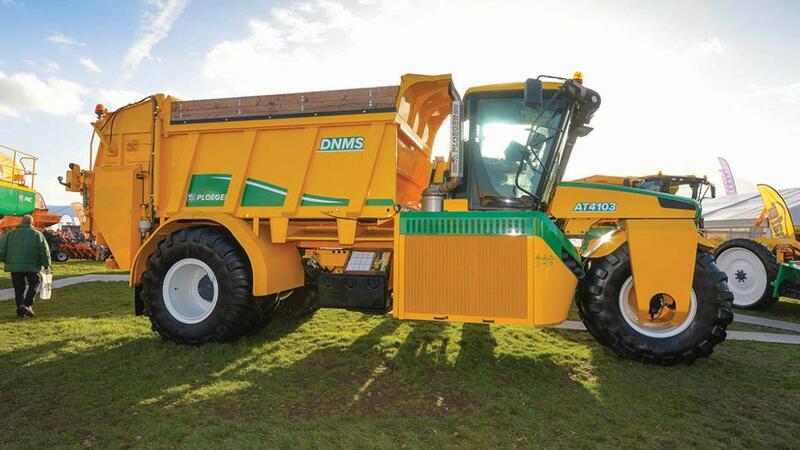 If the Ploeger AT4103 looks familiar, it is because the Dutch manufacturer, best known to UK farmers for its harvesters, has recruited some of the sales and design team who worked on the Terragator applicator range before Agco withdrew it from the market. The range includes liquid applicators for slurry and digestate, solid manure spreaders using Tebbe boxes, liquid fertiliser applicators and a fertiliser spreader using a Bredal body. The initial three-wheel layout will be joined by a five-wheeler this spring, and the common chassis is a bolted design rather than welded as the Terragator was. Ploeger has chosen a Scania five-cylinder, 400hp engine for this model, driving through a ZF Eccom transmission, and tyre choices up to 1,250mm wide. Ploeger is also evaluating a dual wheel system. Drive is via joystick or footpedal and once application preferences are set up on the touchscreen, adjustments on the move can be made on the joystick and adjacent rocker switches. For operators still with a Terragator in their fleet, Ploeger has now taken on servicing and parts across Europe. Following on from the success of its ExaCut ECL macerator, which uses a centrically rotating fibre cutting blade, the firm has launched a new eccentric model. Designed to offer reduced wear and power requirements, while maintaining the cutting force and distribution accuracy of its ECL model, the ETX uses a cutting knife which eccentrically rotates over the cutting screen. Vogelsang reckons, while other eccentric macerators on the market do not run smoothly due to the momentum of the cutting system, counterweights are used to balance its ETX system and keep vibration to a minimum. In turn, the firm says this extends the life not only of the macerator itself, but also of the applicator and hoses. Keeping the cutting running effectively, three adjusters are fitted which can be easily replaced if required, according to the firm. Available now, the ExaCut ETX macerator is available with 30, 40 or 48 outlets. Extending its range of tanker mounted lightweight slurry applicators, Abbey showed a new hydraulically folding dribble bar. Offering a 7.5m working width, the dribble bar features a hydraulically-driven Vogelsang ExaCut macerator to feed the 28 outlets across its width. For durability, all framework is galvanised and has been designed to keep overall weight to a minimum. 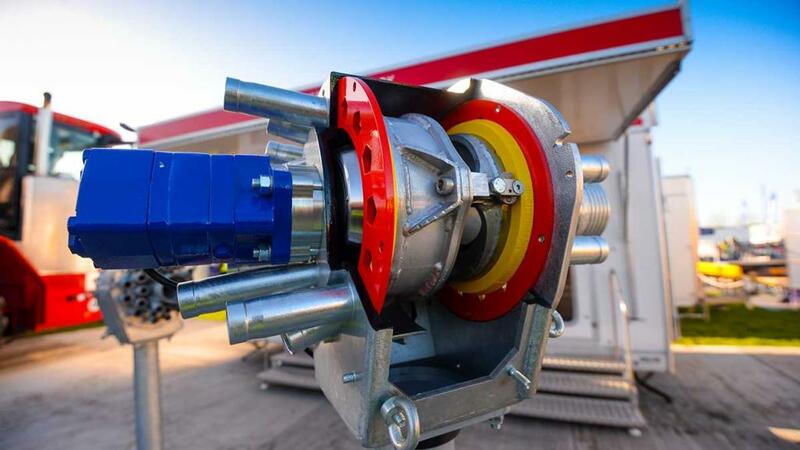 The firm says this allows the dribble bar to be retrofitted, as well as specified on new machines without the need for any additional bracing on the tanker itself. For simplicity, feed is taken directly from the tanker’s rear 150mm (six inch) outlet, without the need to remove the rear door. To provide additional flexibility, a more conventional splash plate and two fill points can still be used at the rear of the applicator. LED lights are standard fitment. 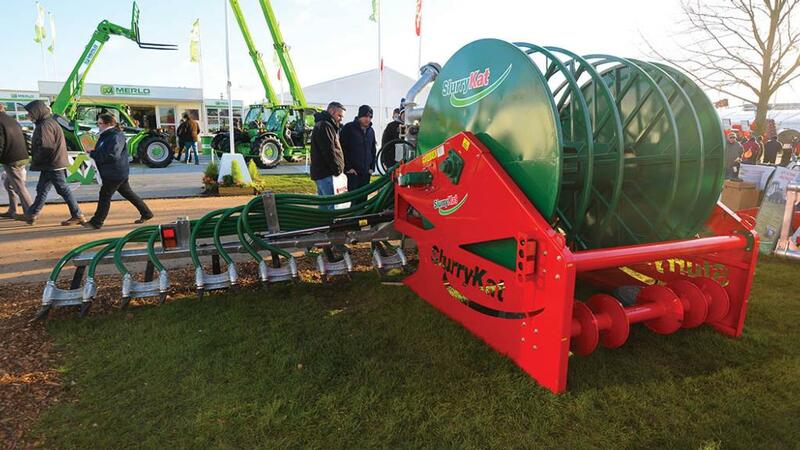 While being able to piggy back an umbilical hose reeler with a dribble bar is pretty common use nowadays, Northern Irish firm SlurryKat says it is the first to launch such a system for a trailing shoe applicator. 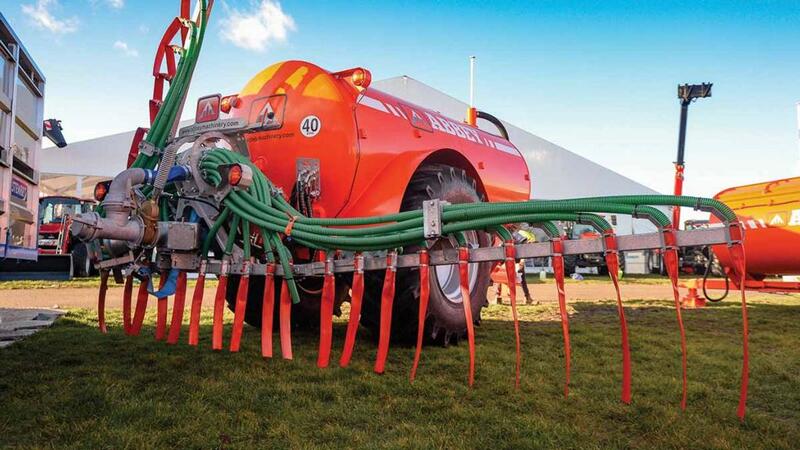 Suitable to mount to a slurry tanker, or for use in an umbilical setup, the applicator uses a Vogelsang macerator to keep slurry flowing to each outlet. When used in umbilical duties, the applicator’s heavy duty A-frame is able to pick up the firm’s newly developed reeler, which can hold up to 1,000m of 150mm (six inch) diameter pipe. To bring the trailing shoes out of work at headlands, the main frame and shoes flip up, meaning you do not have to lift the applicator up on the tractor or tanker’s linkage. This is done hydraulically before the arms vertically fold for transport, with LED lights on both dribble bar and reeler as standard. Currently 7.5m and 10m working widths are available, with a wider 12m model also on its way. Updating its range of Ferti-Space rear discharge muck spreaders, Josking showed its latest generation of the range, Ferti-Space 2. The wide-body spreader range is made up of seven models from 15 to 25cu.m capacities, and fitted with twin horizontal beaters and discs for wide spreading, it says. Transferring muck to the rear are four floor chains with half-width U-slats. Underneath the monocoque body can be fitted bolt-on tandem or tri axles with hydro-pneumatic suspension, offering various axle placement positions to adapt to machine specification. Joskin says the machines are lighter compared to their predecessors and 150mm lower, improving centre of gravity and load-over height. Options include variable rate control and weigh cells.